We’re on part four of the brand audit today, putting our attention on the functionality side of your business. In this section, we’re going to analyse your website for how it works, how it mirrors your goals and how the experience affects client relationships. Ensuring the functionality of your website shows your customer base that you care about how they interact with your business and the experience they have working with you. Most of us make little tweaks to our websites over time. Sometimes those small adjustments and changes – whether they’re a complete website re-design or just a change to the page content – can do weird things to our site performance. When was the last time you checked out your website functionality? Do your pages work regardless of which browser a client might be using? Go through your pages one by one and make a note of any page functionality you need to be aware of. If your website is built on theimagefile system then your pages will work automatically. As I mentioned in the section above, adjustments and changes to your site, however small, can make a huge impact on what you client sees. As more and more Internet users are turning to other devices to shop and browse the net, it’s vital that your site looks just as good and works just as well on mobile devices as it does on any normal desktop browser. Whilst we urge everyone to check that their website works correctly on all mobile devices, if your website is built on theimagefile system this should already be the case. While you’re going through each web page, you might want to take note of any broken links, old links, or any redirects that need attention. This is really important as there is nothing more frustrating for your client than clicking on a link to be told that it doesn’t work. If your website is built within theimagefile system, and you change a page name (which would normally cause a broken link), we will automatically detect that page name change and update the link for you. However, you would still need to check any links to external sites to make sure things are working the way you would expect. 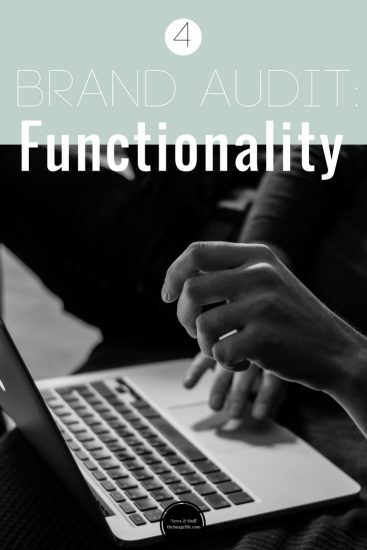 If you’ve been following along with the brand audit series then you will have already established your business goals, identified the services you intend to expand and the process surrounding them, and re-crafted elements of your content. Ideally, these components should be addressed before focusing on this technical part. Go to each page of your site testing links and functionality. Test any alterations and changes in different browsers and various devices. If you have a lot of technical errors or you just aren’t happy with how things are looking then definitely reach out to a designer. You can always sign up to the Website Build Service on theimagefile.